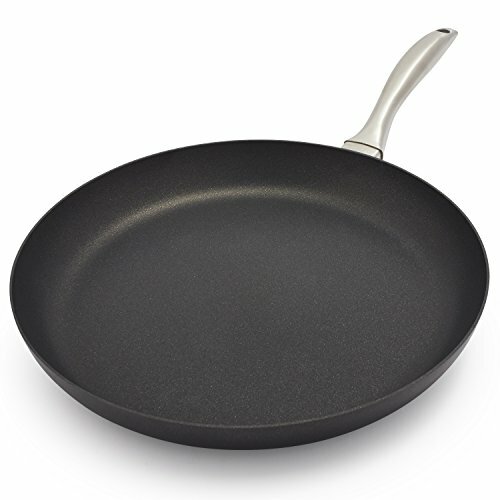 This nonstick kitchen staple from our all-new and exclusive Scanpan collection is available in an ultra-versatile range of sizes ideal for searing, browning and pan-frying. 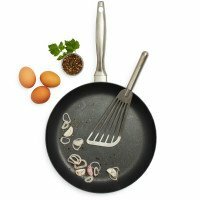 Scanpan has long been an industry leader in nonstick cookware-and their latest innovation delivers the best performance yet. With a five-layer cooking surface, PFOA-free coating and a lifetime warranty, the Pro S5 nonstick collection doesn't compromise on functionality, health or durability. Scanpan's new Stratanium coating is 50% more durable with 30% better release than previous scanpan coatings, offering the best food release and highest durability on the market so you can enjoy healthy cooking for many years to come. Sear, braise and deglaze just like you would with a stainless steel pan-but enjoy the easy cleanup and oil-free cooking that comes with nonstick technology. The five-layer Stratanium surface is extremely hard and durable, so you can even use metal utensils without worrying about scratches. This five-layer system also resists corrosion, ensuring many years of use. The Pro S5 cookware collection features rivetless stainless steel handles that are firmly attached to the pressure-cast aluminum body-an indispensable first-time innovation that ensures impeccable hygiene. Without the small gaps and cracks typical of standard cookware handles, these rivetless handles are easy to thoroughly clean.